Another week, another doping story, and this one is a big one. You surely haven’t missed it, and by now you know that in response to a British parliamentary hearing, Paula Radcliffe issued a statement which acknowledged what pretty much everyone following the sport knew – hers were among the samples deemed suspicious in the recent expose on doping in athletics. I’ll get right to it – her statement offered three explanations for three elevated off-scores. They were altitude training, the timing of one sample (which basically amounts to saying it is invalid as a result of hydration status – more on this below) and the use of antibiotics for illness (whether the illness or the anti-biotics are the cause is unknown). Let me talk briefly through a few things that have come up in the last two days. Some of this relates to the off-scores, the hemoglobin and other technical concepts that may be new to many. I have tried my best to explain all these AT THE END OF THIS POST, almost like an addendum, so if you’d like, start at the bottom for the background. Or just continue, as we look at the explanations. So we have these three explanations, and we also have (see below) the off-scores in question. They are high, else they wouldn’t have been noticed, but they’re not so impossibly high that all explanations can be dismissed out of hand (See: Shobukhova). Those three explanations are thus possible, and even plausible, but too much information is missing for people who want to know the truth to believe them as they have been stated. Radcliffe stated that she had expert support for her explanations for those suspicious values. The problem is (and I’m saying this for the benefit of people who are perhaps not close enough to the sport to know this context), people don’t trust passionate, convincing pleas for trust. Words are relatively meaningless, especially when they come from the athlete (we’ve seen this movie too often), and so even if these experts do exist, people need/want more. Perhaps she needs the expert to do the explaining, instead of assuring us they exist, and that they’ll be rolled out at a later occasion (why drip-feed the story though, it’s just facilitating a feeding frenzy?). Perhaps it is just a case of terrible PR and messaging, but the failure to provide promises without details, and instead to declare that she has data would clear her, but that she won’t release them (pride? anger? principle?) is only feeding cynicism that has been growing for many years. Those possible, plausible explanations could be made to look credible if they were openly discussed, and that would require maximum transparency. Let me illustrate this by looking specifically at one of them – the dehydration/timing of the test issue. Radcliffe’s claim is that her elevated off-score was the result of a sample taken immediately after finishing a race in very hot (30C) conditions in Portugal. The best-practice for sample collection now says that samples must be obtained at least two hours after completion of the race, so “right after” (whatever that means, exactly) would render the sample invalid using the current biological passport processes (fair enough, but there’s no chance of a ban, anyway, just a perception). 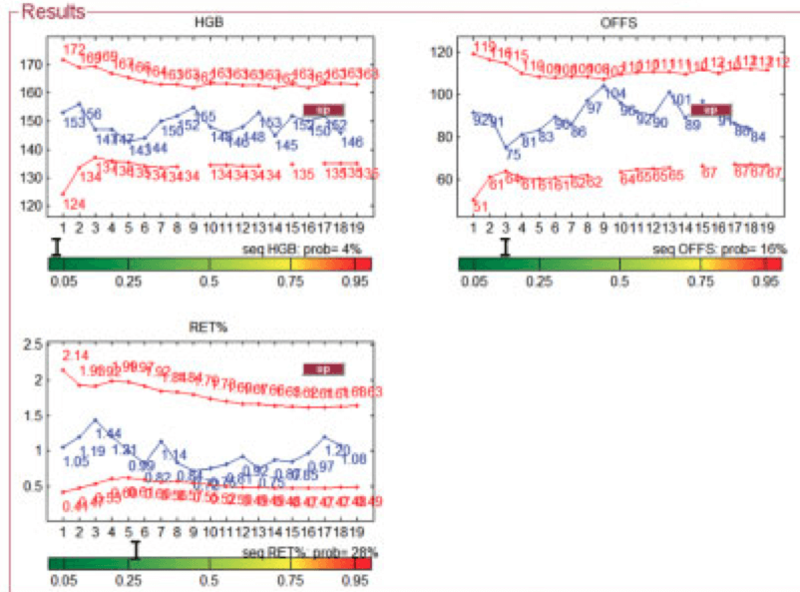 Note both the hematocrit and hemoglobin values – they actually go DOWN, not up. That’s the result of plasma volume expansion, shown in the following figure. 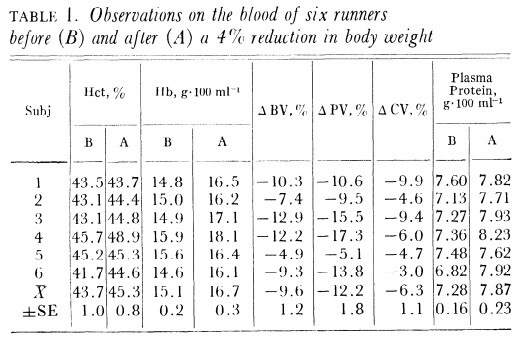 The plasma volume increases by about 7% compared to pre-exercise values – these women didn’t drink during the trial either, by the way, so you’d expect them to lose perhaps 1% to 2% of their body mass, assuming sweat rate of 800ml – 1000ml per hour. As mentioned, this plasma volume expansion is the result of transient fluid shifts into (in this case, the fluid can move the other way in different circumstances) the intravascular spaces. More volume, same red blood cell mass, and so the concentration of hemoglobin goes DOWN, not up. 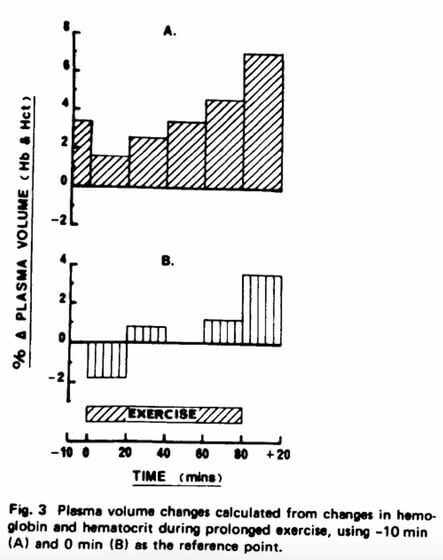 However, there are other situations where the plasma volume decreases during exercise, and the opposite outcome occurs. This happens because of fluid loss in the form of sweating. It’s what you know as dehydration, and if it is sufficient, then the plasma volume can be reduced to create a situation where you now have the same red blood cell mass in a smaller volume, and hence an increase in hemoglobin concentration. So, on average, losing 4% of your body mass increases the hemoglobin concentration by 1.6 g/dL. The most extreme case (of this admittedly small group of six) increased hemoglobin concentration by 2.2 g/dL (Subject 3). Similarly, hematocrit increases by 1.6%, with a maximum increase of 3.2% (Subject 4). Could a 2.8 g/dL increase in [Hb], from 12 g/dL to 14.8, occur as a result of significant dehydration? The study above took 2.5 to 3 hours, she ran for 67:35. She says it was 30 C, the historical reports for the day suggest 24C. So we don’t know, but it’s not impossible, and that’s the point. So herein lies the crux – there are other variables, associated with dehydration, that would lend credence to the position of dehydration. 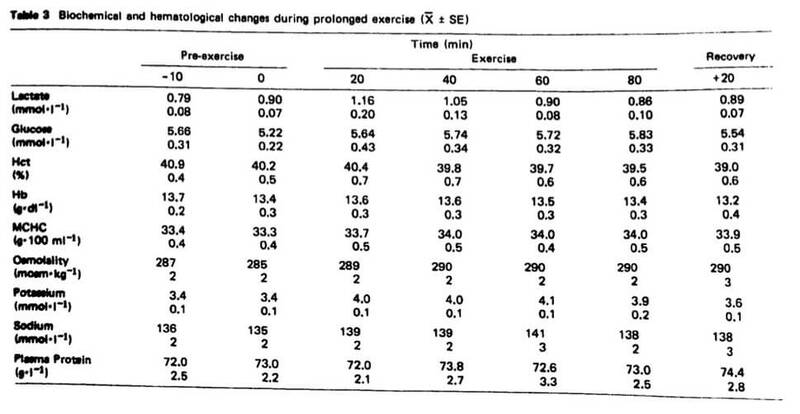 You could look at osmolality, body weight changes (though I’m not sure these are routinely measured). Even confirming the weather conditions on the day, and the timing of the test relative to finishing the race, and disclosing these values alongside the off-score, the hemoglobin concentration and the reticulocyte % would help turn a possible into a plausible into a credible explanation! What has happened as a result of the caginess and secrecy is that information is being ‘drip-fed’ to a hungry public and media, and whether you think this is a trial by media, it’s what you’re dealing with once it is out in the public. So already, the Portugal story has been challenged on two fronts. First of all, it wasn’t 30C on the day – historical weather records put the maximum temperature at 24C, with an average of 21C. You could counter that by saying the race was run in the sun. Then second, an athlete who raced at that event has stated publicly that the testing wasn’t done immediately after the race, but only after all the competitors had finished, allowing Radcliffe what he estimates as at least 90 minutes to chance to shower, change and most importantly, drink. Then there’s the fact that she won the race, the world championships, by almost a minute and half, in 67:35. With a hemoglobin of only 12 g/dL, which is quite remarkable. Are any of these allegations true? It almost doesn’t matter, because their existence undermines what is otherwise a plausible explanation, but those allegations exist only because you haven’t presented all the facts in support of your position in the first place. Fact of the matter is, if Radcliffe could produce timing, weather conditions, the contributing values to the off-score (Hb and reticulocyte %), as well as hematocrit, and all other associated blood parameters (many of which could indicate just how dehydrated she was), then she’d occupy the position of strength, rather than ceding it to “guesses”. The same goes for giving an isolated value. In her autobiography, she states that she was tested BEFORE AND AFTER this race. That means there is an off-score within a day or two of the race. Make it known. Perhaps, as in my hypothetical illustration above, it’s down at 75 because of a low hemoglobin and a relatively low reticulocyte % (the result of the illness? The anti-biotics? ), and then your explanation looks stronger. The same argument is true for altitude training. Don’t speak only about the two off-scores that you believe are elevated because of altitude. If you want the public and media to fully accept the explanation (maybe you don’t, but then spare us the drama about your children searching your name on Google and finding “doper” in the results), then offer the full explanation. I won’t go into all the detail, but altitude is known to elevate off-score because it drives the [Hb] higher, and when returning from altitude, the reticulocyte percentage falls. Both will increase the off-score, but again, both can be accounted for if you have the full set of data, instead of asking for trust (of yourself, and those experts. Or let them speak for themselves). While on this subject, she had to have been tested loads of times, both before, during and after altitude training periods. Those scores could strengthen her position, because they may present her as an athlete who responds well to altitude with [Hb] and reticulocyte % changes. There cannot be only three measurements, and she cannot only have been to altitude on two occasions, so that data could, in theory, clear her. It could, of course, incriminate her more by showing just how extreme those three suspicious values are, I realise this. And that’s what people are going to believe, which is why, if the data does help, it’s ludicrous to hold onto it. So here’s what I’d be doing. The very second those allegations were published, and the media started whispering about who the ‘mystery’ British athlete was, I’d have found a way to contact Michael Ashenden and Robin Parisotto. Why them? Because they are going to be your “accusers”, even though they’re not directly making a specific, personal accusation. And because of that, when this story hits the mainstream media, it is going to be played out as an “us vs them” story. Ashenden & Parisotto on one side, the athletes and sport on the other side. Of course, Seb Coe helped this process along by stupidly calling the report a declaration of war, and by then the lines were drawn. Radcliffe, if innocent, would have benefitted enormously from getting THOSE experts, not WADA or self-appointed people, to comment publicly on her data and the context she (rightly) informed us matters when interpreting blood values. Go to them, give them everything – the test results, the contributing scores, your altitude training dates for the periods in question and other altitude camps, your medical record for those anti-biotics, the timing of the tests and say to them “You are the experts, and you are about to become the most trusted anti-doping voices in athletics. You look at those values, with the full context I am prepared to give you, and tell me if you still think I’m doping”. Maybe they’d say they are not prepared to get involved, in which case you’ve earned yourself a strategic position of strength because you can later tell the world that you tried to reach out to Ashenden, with nothing to hide, and he refused to get involved. Or maybe, just maybe they’d say yes, and they’d agree, and then you wouldn’t need to find a new set of experts, you would be the only athlete in the world who has those two supporting your explanations. So, to wrap up – is Radcliffe lying? I don’t know. Her explanations are all plausible, but she hasn’t helped the situation or the credibility of her own explanations by playing this the way she has. Is that bad PR, or does it indicate something more sinister? The manipulation of the message may be done with the purpose of preventing all the information from coming out, because maybe that information condemns her, rather than exonerates her. We simply don’t know. But I will say that I’d be open minded enough to accept those explanations if they were offered with maximum transparency. I’m not so cynical that I think she’s doped, but I’m also not as trusting as some of you (on Twitter and Facebook) who are already convinced of her innocence because a couple of experts have apparently looked at the data and agreed with her explanations. And no, I don’t want to see the data myself, I don’t need to be the only expert I believe. But the process by which the ‘proof’ has been offered has created more doubt than I had to begin with. The status quo is this – there are people who believe, and always will. There are people who don’t believe her, and never will. And then there is a significant portion in the middle who I think want to believe, or don’t know what to believe. All they know is that they’ve believed before, and been proven wrong, or they feel that they have heard this all before. For those people, transparency is the answer. Worst case scenario, the doubters keep doubting, the believers keep believing, and the uncertains remain uncertain about the technical data, but are encouraged by how open and transparent you are being. It is the ACT, and not necessarily the data, that will help convince many people. Best case, your data is plausible, it is credible, and you earn trust with both the data, and your willingness to share it, because that was, after all, your position not too long ago. Thanks for reading, if you want more on the off-score, I’ve tried to explain it below. So here’s a section explaining the off-score concept, for those in need of a refresher! 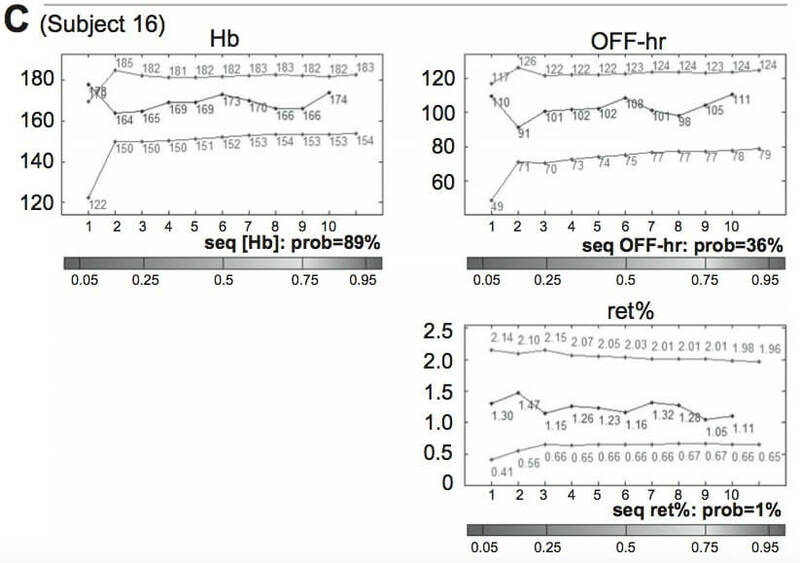 If Hb is high & Ret% is low, then off-score is high, and vice-versa. At some point, the off-score gets so high, it is strongly indicative of doping (the 1 in 100, 1 in 1000 thing). For example, Shobhukova had an off-score of 153 (yikes). The off-score can also be so low that it suggests doping, and these “cut-offs” or limits are known. Radcliffe’s values (115, 110 & 109) lie either just below (2) or just above (1) the off-score upper limit WHEN TAKING ALTITUDE INTO ACCOUNT. That is, there is a different ‘cut-off’ to deal with altitude cases, because altitude is known to affect the blood. So a normal cut-off of 103 is increased to accommodate this recognized possibility/explanation. Anyway, the point is that Radcliffe is NOT a Shobhukova type example, though her numbers are still high. Where it gets tricky, however, is that off-score values are ONLY PART of the picture, which is why releasing 3 off-scores is not conclusive of anything, even if they are close to those cut-off limits. That’s because the whole premise of the passport is to measure CHANGE over time, and so a value can be “normal” and thus not flagged by itself, but when that value is looked at relative to others, it may be marked anyway. Because of this, a ‘spot’ off-score of 100 might be more suspicious than a value of 110, if the preceding values were 70 vs 105, respectively. The biological passport software does have an adaptive component that works out a sequence score, but we’re dealing here with “spot” off-scores. 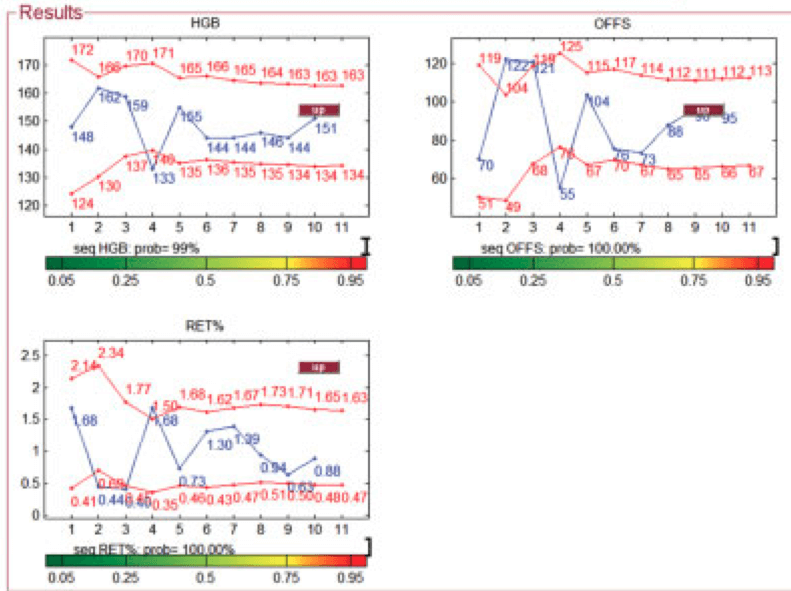 Perhaps even more importantly, it helps to know how that off-score is generated – you can produce the same off-score with different combinations of Hb & Ret% (which would, in theory, allow you to mask doping by manipulating half the equation to hide the other half), so really, isolated off-scores tell you nothing other than you’re not dealing with Shobukhova-level doping here! In fact, off-score alone is like power output in cycling. At some point, it’s so high it screams DOPER. But when lower, it doesn’t prove non-doper, and you instead need to appreciate the nuance. So only releasing part of the data seems to be to actually obscure that, which is ironic because it makes this issue so much MORE DIFFICULT to understand (which was Radcliffe’s justification for keeping it out of the public eye in the first place). All the facts – easy! Half the facts – impossible! What would help to test each of Radcliffe’s explanations (altitude, illness, hydration) is the specific values (Hb & Ret%), not just an off-score, and to do so over a longer period. Each of her explanations is a hypothesis (“Dehydration after running in the heat has increased my Hb concentration and triggered a high off score”, for instance. Or “A period of altitude training has elevated my Hb and suppressed Ret production to produce a high Off-score”). These “hypotheses” are entirely testable, and if they pass the test, believable, and on top of it all, she’d be playing open cards, which is worth a great deal in the climate of mistrust. I still feel that her explanations are POSSIBLE, and complete data would make them PLAUSIBLE, and that equals trust. But the half-truths & opaqueness make it less plausible, at least to me (opinion). It’s the ACTION, not necessarily the data, that speaks loudest. To further appreciate how this all comes together, below are some graphs showing off-scores of athletes (disclosed mostly by the athletes themselves) and research participants in trials on the passport. Note how the upper and lower cut-offs or limits vary, not only from one athlete to another, but also over time within the same athlete. That’s because the system is designed to be individualized and adaptive. A false positive for Hemoglobin (very first value) from that same study. Note – if the off-score is higher than the upper limit, then it’s different – it triggers suspicion. It’s the ones that are lower that don’t necessarily prove no doping, because of the importance of their place in the timeline for each athlete. And no, we don’t know what data Ashenden & Parisotto were looking at, or what context they had. I hope it all emerges in the future. 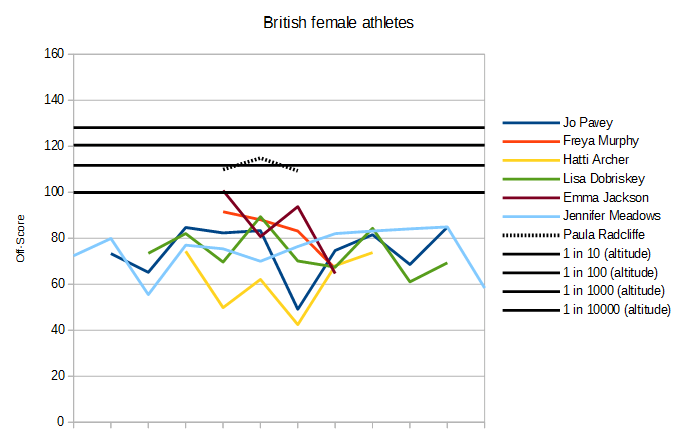 The final graph was put together to compare Radcliffe’s values to other British female athlete’s, just for comparison. Here too, you need to see other values to know if Radcliffe’s high values are cause for suspicion, or whether you’re just looking at an individual ‘fingerprint’ that differs from others’.